Navigation: Home » Real Estate » Is The Homeownership Rate in America the Lowest in History? Is The Homeownership Rate in America the Lowest in History? As you probably assumed anyway, due to Betteridge’s Law, we aren’t currently in a homeownership trough. The recent homeownership rate posting of 62.9% for the second quarter of 2016 is not the lowest in history, nor is it even the lowest in recorded US history. However, it is the lowest post in 51 years(!) – not since the third quarter of 1965 have we seen homeownership rates this low. And why are we at DQYDJ bothering to look now? A while back, we did a two-part deep dive into the history of the 30 year mortgage and the history of the (recorded) homeownership rate in America. That research dug up some very interesting information. First, long dated mortgages of 15, 20 and longer years started in the mid 1930s. Second, private mortgage insurance (which was mostly done in by the Great Depression) started up in 1957 with the Mortgage Guaranty Insurance Company. (Note that until the 60s there wasn’t as much resolution in the series – see our historical research for details). The lowest homeownership rate since 1957’s PMI innovation was a 61.9% rate in 1960. The lowest homeownership recorded since 1890 was 43.6% in 1940 – in the midst of the Great Depression. Why Is the Homeownership Rate Dipping? Oh, you won’t accept ‘people are renting more’ as an answer? Yes, the runup in real estate prices in many areas of the country (so soon after the Great Recession!) is a huge factor. But, so too are the massive demographic changes underway in our country. As we have pointed out many times, the Millennials (of which I count myself as an older member) now makeup roughly 25% of the workforce. Millennials have different living arrangements than past generations – a greater propensity to live at home, a seeming desire to be free to change jobs (and areas!) more often, and, yes, more expensive housing options. That last point, of course, prices many Millennials out of the market – renting makes much more sense when you look at the home prices in many metros in the United States. Can It Change? Will We See the Rate Rise Again? Yes – as of right now, I don’t see the drive towards renting (and living at home) to be a sort of permanent desire. Already there are countering trends – the so-called “Tiny House” movement one of them (and, yes, I have been searching for a place to name-drop it!). It’s safest, at this point in time, to assume Millennials will tend to be similar to their parents – eventually leaving the city to marry, have kids and buy homes. You know, like yours truly. However, we’re looking into the future here. Marriage is trending towards being an institution for older and older couples, along with kids. 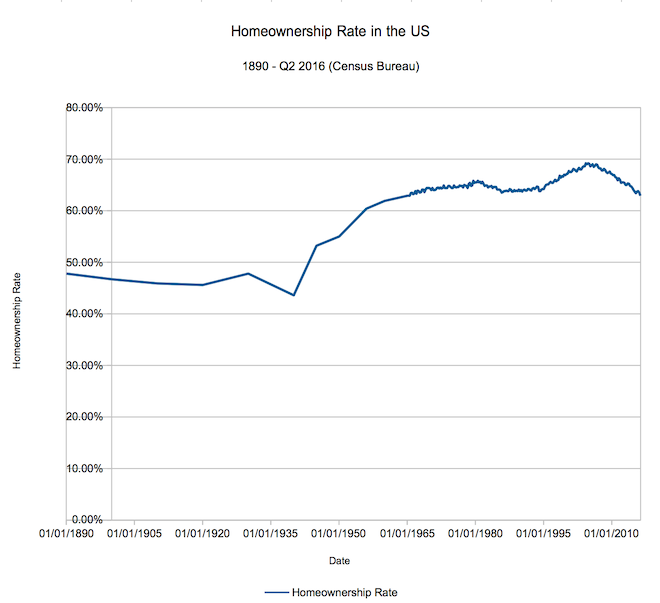 If these trends keep up, we might start to get into uncharted territory here – I’d love your input on whether you think homeownership rates will recover, or high-60s was an anachronism. Will we see an increase in homeownership led by the Millennials? Sorry I’m not adding anything more meaningful, but I just have to say that.